Tensions on the Taiwan Strait. October. 26, 2018 07:16. by Sang-Ho Yun ysh1005@donga.com. The Taiwan Strait is a natural Military Demarcation Line that divides China and Taiwan. The Strait, which is 130-180 kilometers wide and around 50 meters deep, has strong currents that serve as a natural seawall that protects Taiwan against China. For China, it is simply a geographic nuisance that hinders its “One China Policy” (recognizing Taiwan as China). The term “cross-strait” relations, which refers to the relations between the two nations, is derived from the west facing strait (China) and the east facing strait (Taiwan). When bilateral relations suffer, the Taiwan Strait faces raging waves. On August 23, 1958, China dropped some 30,000 cannonballs over two hours in Jinmendiao of Taiwan. The bombing continued for over two months and killed 600 Taiwanese soldiers. At that time, Mao Zedong, backed by U.S. support, warned that he would not tolerate any scheme embracing Two Chinas or an independent Taiwan. The U.S. Eisenhower government dispatched six aircraft carriers to the Strait, and some feared risk of atom bombing on China. When two U.S. naval vessels passed the Taiwan Strait in July this year, this provoked China once again. The U.S. Defense Department announced that it was a general navigation conforming to international laws, while China argued that it was an attempt for naval blockade. Chinese public media sharply criticized the U.S. action as a pretext using Taiwan for interfering in domestic affairs. 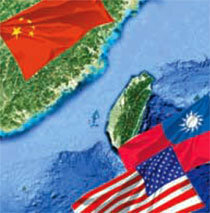 The Taiwanese defense department said that it understood the U.S. operations to cross the Strait. China views the Taiwan Strait was a key gateway to the Pacific as well as a foothold to secure naval supremacy in the Eastern and Southern China sea. It aspires to unify Taiwan and take over the Taiwan Strait to ensure that no country would dare come around in its territory. Washington, on the other hand, appears to increase its operational scope to promote “the freedom to navigate” against Beijing’s actions. We should be mindful of rising tensions between the U.S. and China on the Taiwan Strait and watchful of what impact it may have on the Korean Peninsula.